The classic route to Cima Grappa. Location of the Madonna del Grappa framed in the center of the ornate window. 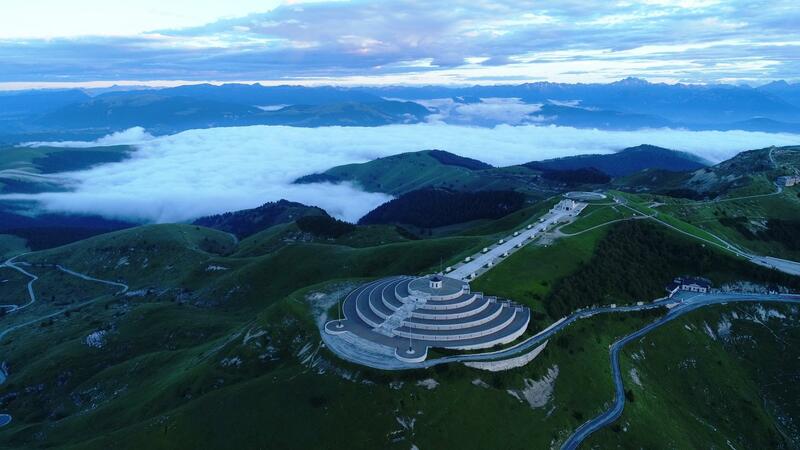 This is known as the “Classic Route” up Monte Grappa and, along with the route from Semonzo, the most popular, as confirmed by the amount of Srava attempts (3,453; Semonzo is a close second with 3,337 ) compared to the other routes (other routes range from 15 to 850). We consider Monte Grappa a Bucket List cycling experience. We begin our climb in Romano d’Ezzilino and if you are participating in the Brevetto del Grappa, this is where you acquire your “Journey Book” (the sheet you have stamped at the bottom of each of the 10 paved and 1 dirt ascent and at the one common finish at the top of the climb, i.e. the Cima Grappa). Romano d’Ezzelino is a good sized town of 14,500. We stayed in and highly recommend Bassano del Grappa, particularly our hotel which was reasonably priced with very helpful english speaking staff and cycle friendly - Hotel Alla Corte (this is not a paid ad and we get no benefit from plugging anything on our website). Each night the front desk attendant would graciously call the 2 locations we would start the following day to ensure we could get our stamp on the day and time we expected to arrive. Heavy tree canopy covering road on lower portion of climb. There are seven switchbacks from miles 1-4 (km 1.6 to 6.4) which offer us good views back towards Romano d’Ezzilino and Bassano del Grappa to the south. All 11 routes up Monte Grappa ultimately connect. The Romano d’Ezzilino route goes the longest without intersectin another climb route - at mile 14.7/km 23.7 Romano merges with the three northern routes (Cismon, Caupo, and Seren) and .4 miles/.6 km from the top merges with the 6 climbs beginning to its north and northeast (Semonzo, Crespano [dirt/gravel], Fietta, Possagno, Cavaso del Tomba, Pederobba and Alano). We spent 6 days climbing the 11 routes up Monte Grappa and Romano d'Ezzelino was the most heavily traveled by cyclists, many of whom were quite friendly and chatted with us using very good to broken english (our Italian is broken, but we are quite good at asking directions and ordering panino, cappuccino and gelato in Italian - we are survivors!). All 11 Monte Grappa routes end at the Rifugio Bassano a Cima Grappa which is a cafe with many outside chairs and tables which is frequented by many cyclists each day - this is a very popular Italian cycling destination. The Rifugio is just below the Sacrario del Monte Grappa which is a monumental burial site for approximately 20,000 of the Italian and Austrian soldiers who died in battle on the hillsides of Monte Grappa during World War I.
Walkway on top of Sacrario militare del monte Grappa. Location of the Madonna del Grappa. Rifugio at the top of the climb. Great food and drink here. Very popular location for cyclists. Semonzo appears to be the Giro’s choice of Monte Grappa ascents (we have been unable to identify the Giro routes up Monte Grappa in 1968, 1974 and 1982. 11 climbs in 6 days. Cycling to Monte Grappa from Romano d'Ezzelino is the “Classic Route” up the mountain and, along with the route from Semonzo, the most popular, as confirmed by the amount of Srava attempts (3,453; Semonzo is a close second with 3,337 ) compared to the other routes (other routes range from 15 to 850). Other climbs within a 20 kilometer straight-line radius of the start of this climb are Monte Grappa Semonzo, Monte Grappa - Crespano, Monte Grappa - Fietta, Monte Grappa - Possagno, Bocca di Forca, Monte Grappa - Cavaso del Tomba, Monte Grappa - Cismon, Monte Grappa - Alano, Monte Grappa - Pederobba, and Monte Grappa - Seren del Grappa. Access these other climbs by clicking "Routes in Area" on the climb card above right.